But the most reliable source of idol worship at TIFF has to be the nightly die-hard communion that is Midnight Madness, where genre fans turn out in droves to pledge their allegiance to the virtues of B cinema. And few guests of honor could command as much loyalty from this particular demographic as View Askew mastermind and geek-culture mascot Kevin Smith. At the Saturday night world premiere of his new movie, the writer-director crossed the stage of the Ryerson Theatre in signature jersey and shorts, playing to his constituency—many wearing plastic walrus masks, for reasons I’ll get to shortly—liked an old pro. Smith took a self-deprecating potshot at his own Cop Out. He took a selfie with the audience. And he relentlessly flattered the country playing host, even slipping the Canadian national anthem into the pre-screening playlist. Turns out the man’s movie, Tusk (Grade: C-), is itself something of a pandering salute to the Great White North: Many of the gags are just toothless Canuck stereotypes—lots of “aboots” and hockey talk, har har—delivered by a boorish American hero who gets severely punished for his insensitivity. (Was the film specifically designed for Midnight Madness?) At heart, Tusk is really little more than a jokey riff on The Human Centipede, its mad-scientist character obsessed with creating not a surgical conga line, but a kind of shrieking man-walrus. The best that can be said here is that Smith has modestly improved on the actual Centipede. There was, of course, almost nowhere to go but up. The Mallrats director is a bit more confident behind the camera than he used to be, and Tusk has a few moments of lunatic inspiration, most of them between the aristocratic antagonist (Michael Parks, really getting into the spirit of this nonsense) and his unsuspecting victim, a podcast shock jock played by Justin Long. (The latter is pretty unconvincing as a vulgar cad, more convincing as a blubbering, terrified lab experiment.) But just about any scene outside of the bad guy’s backwoods lair—including the subplot of the hero’s girlfriend (Genesis Rodriguez) and cohost (Haley Joel Osment) conducting a manhunt—grinds everything to a halt. Smith remains married to his own overwritten dialogue, so much so that he even ruins an extended star cameo by drowning it in endless yakkity yak. 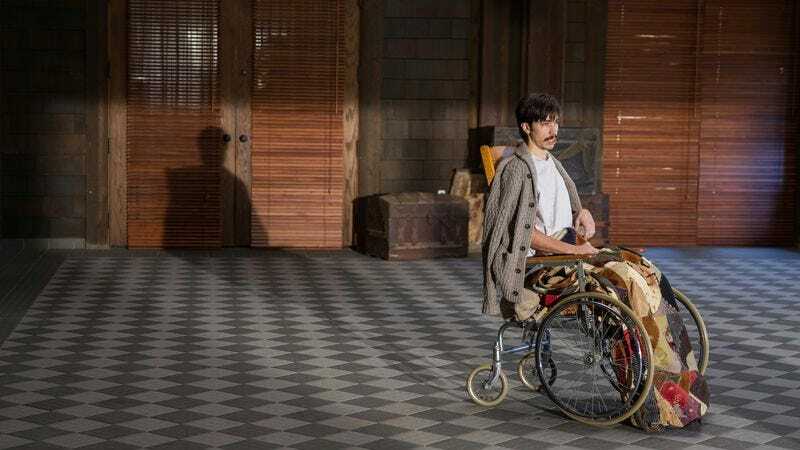 Tusk grew out of a podcast joke, and it shows: There’s a making-it-up-as-we-go-along quality to the movie, which seems too satisfied with its own nuttiness to be truly transgressive. In truth, Midnight Madness is always pretty hit or miss, though there’s at least one terrific selection—the ultra-creepy Cannes favorite It Follows—included in this year’s lineup. These days, the more adventurous and unsettling genre films tend to pop up in Vanguard instead. Right before running over to catch the premiere of Tusk, I took a chance on one of that section’s selections, an Austrian thriller called Goodnight Mommy (Grade: B). The film, about a pair of troubled twins (Lukas and Elias Schwarz) making life hell for their mysteriously disfigured mother (Susanne Wuest), is built around a climactic twist I figured out in the first five minutes. So committed are the filmmakers to not cheating on their premise that they repeatedly show their hand, to the point where the big, belated reveal feels entirely anticlimactic. Not that it really matters, though, as the movie is otherwise pure nightmare fuel, building in intensity from its artfully uneasy opening scenes to its closing gauntlet of horror. The violence becomes almost unbearably brutal, and I can’t blame the multiple viewers who sprinted for the exit when their breaking points were reached. But fans of extreme cinema should consider this a must-see. Vanguard alumni Peter Strickland returns to the section with his bewitching The Duke Of Burgundy (Grade: B+), an even better genre whatsit than Berberian Sound Studio. If the point of reference for that earlier curiosity was ’70s Italian horror, this new one riffs on the Euro erotica of the same era, including the Sapphic softcore flicks of Hammer. The breathlessly stylized opening scenes introduce a timid young maid (Chiara D’Anna) and her middle-aged entomologist mistress (Sidse Babett Knudsen), who seem to have an abusive, sadomasochistic relationship. I say “seems” because the film quickly subverts expectations in a way it would unfair to reveal. Suffice to say, Burgundy turns out to be a much funnier and more humanistic picture than it initially appears, applying the tropes of its chosen genre—including some heavy fetish fuel—to a richer study of desire and relationships. While Berberian was dazzling but slightly empty, Burgundy is heavy with feeling. There does appear, however, to be a slight disconnect between its hypnotic formal pleasures (an insect motif, for example) and its more grounded narrative ones. But both are satisfying in their own right; perhaps further viewings will reconcile that discrepancy, which fellow A.V. Club writer David Ehrlich insists is integral to its value. While genre fans both discerning and not feasted on a slate of “alternative” programming, others flocked to more mainstream attractions. One of the big premieres of the weekend was While We’re Young (Grade: B+), the latest comedy of discomfort from Noah Baumbach (The Squid And The Whale, Greenberg). Actually, there’s not that much discomfort to this one; it’s far and away his most accessible effort—a kind of highbrow Neighbors, exploring the generational gulf between a fortysomething couple, Josh (Ben Stiller) and Cornelia (Naomi Watts), and the mid-20s spouses, Jamie (Adam Driver) and Darby (Amanda Seyfried), that they befriend. Josh, a documentary filmmaker caught in a decade-long rut, initially feels energized by his new companions, who relentlessly flatter him. But when Jamie begins chasing his own dreams, and using Josh to achieve them, trouble comes to paradise. Most of Baumbach’s recent work has been sharp character studies, designed to carefully dissect the neurosis of unsympathetic protagonists. While We’re Young deals in broader strokes, its characters a little less complicated than, say, the eponymous antiheroes of Greenberg or Margot At The Wedding. There’s also a certain cheap-shot easiness to the humor, which hinges on pat hipster critique, like the total newsflash that millennials fetishize old pop-culture. Thing is, though, the jokes still kill: Baumbach has become a master of the pithy punchline, and he’s loaded his latest with plenty of hilarious sideline gags. (A personal favorite: Every time Josh tries to explain the premise of his stalled, six-and-a-half-hour, Shoah-esque documentary, he defaults to, “It’s really about America.”) And Baumbach subverts the false catharsis of his ending by refusing to let it play out exactly as expected; he’s too smart to follow the modern comedy template too closely. Thinner though it may be, While We’re Young never lacks for feeling. Baumbach is clearly grappling with a lot here—not just fears about getting older, but also a sense of being stuck between multiple age groups. (A late conversation between Josh and Cornelia about maturity is rich with insight.) On some level, perhaps the filmmaker has exhausted his capacity for cruelty; if Greenberg took that quality of his work to its outer limit, While We’re Young offers a more charitable, less caustic vision of growing older. The biggest thing working against the film is that it follows Frances Ha, maybe the high point of Baumbach’s whole career—though this new one does boast the advantage of more Adam Driver, screamingly funny as a chameleon-esque careerist. Driver is also a highlight of This Is Where I Leave You (Grade: C), which finds an outstanding ensemble cast struggling to pump emotion into a sitcomish blend of pratfalls and heart-to-hearts. Though based on a novel by Jonathan Tropper, who’s adapted his own work for the screen, Shawn Levy’s bathetic comedy plays like a Zach Braff rewrite of August: Osage County. The death of a family patriarch brings together four adult siblings (Jason Bateman, Tina Fey, Corey Stoll, Driver), whose mother (Jane Fonda) convinces them to sit Shiva to honor their father’s dying wishes. Each character has an identifiable life issue, and very quickly a pattern emerges: Broad comedic set-piece, followed by Very Special Moment, and repeat. It’s a shame, because all the actors are terrific, working overtime to sell this sentimental snake oil. Bateman, especially, throws his heart into the work, locating a melancholic charm he hasn’t achieved since the original run of Arrested Development. A great cast is a terrible thing to waste. As cornball dramedy goes, I much preferred the fact-based Pride (Grade: B-), about the 1984 alliance between a U.K. gay and lesbian activist group and the striking miners they decided to support. Shamelessly manipulative in some respects—most of the laugh lines hinge on the hilarity of little old British ladies asking candid questions about homosexuality—the film nevertheless gains a certain stirring power, almost of all of it owed to the inspirational events from which it’s inspired. (Those rousing Welsh union songs don’t hurt either.) Some stories are worth getting misty-eyed about, and some crowd-pleasers really please. I chased those two commercial offerings with smaller, more idiosyncratic selections, both of which functioned, in their very different ways, as portraits of community. Tales Of The Grim Sleeper (Grade: B), the latest from English documentarian Nick Broomfield (Kurt & Courtney), investigates the years-spanning crime spree of a notorious serial killer, who murdered upwards of 100 young women in South Central Los Angeles. Broomfield explores the case mainly through the anecdotes of members of the community, a strategy that makes the film feel like both an oral history and a lament for a neighborhood whose young women—some hookers, some not—went unprotected and un-avenged by L.A. law enforcement for decades. Some of the interview subjects are admittedly more interesting than others; for a while, the normally camera-hogging Broomfield makes former prostitute Pam his guide of the city, and the movie suffers from her eventual absence. Meanwhile, the Director’s Fortnight favorite Tu Dors Nicole (Grade: B+) belongs to a genre I’m a sucker for: the last-summer-of-adolescence movie, in which some aimless youth passes slowly out of childhood, perhaps without really noticing. This a gentle, sporadically surrealist addition to that tradition, following the titular heroine (Julianne Côté, perfectly ordinary) as she foolishly obtains (and maxes out) a credit card, grows apart from her best friend, fruitlessly flirts with a bandmate of her older brother, and generally copes with the boredom of a long, hot, uneventful season. It’s a fundamentally minor movie, distinguished chiefly by its gorgeous black-and-white cinematography and little bursts of comic strangeness, like a smitten preteen with a deep, manly voice and the soul of a poet. Mostly, I connected to its gentle melancholy, the sense of a life changing in almost imperceptible ways. Last and most certainly least was the second of two Al Pacino old-man vehicles playing the festival (the other being The Humbling), David Gordon Green’s damn-near-unwatchable Manglehorn (Grade: D). Green has lately experienced a kind of artistic comeback, putting an end to his stoner-comedy slumming period with the very solid companion pieces Prince Avalanche and Joe. His latest lands squarely in the poetic-drama column of his oeuvre, but it’s such a tedious ramble of a movie that Your Highness can’t help but look preferable. Pacino plays an aging key-maker who spends his long days doting on his cat, ambling around his Texas town, and musing endlessly—in self-parodic voice-over—about the one that got away. Passing into his orbit are a big-hearted bank teller (Holly Hunter), who takes an inexplicable shine to this mumbling recluse; a seedy acquaintance (Harmony Korine, behaving like a character in a Harmony Korine movie); and his justifiably fed-up son (Chris Messina, responsible for the film’s lone traces of recognizable human behavior). Green demonstrates no control over his star, who dodders through the movie in a sleepy daze. In what scans as an ill-advised attempt to capture the hero’s headspace, the director overlaps internal monologues, off-screen dialogue, and a gratingly whimsical score by the normally reliable Explosions In The Sky. Sonically and visually, the movie is a mess; dramatically, it’s barely a movie at all—an aimless character study with no grip on its character.